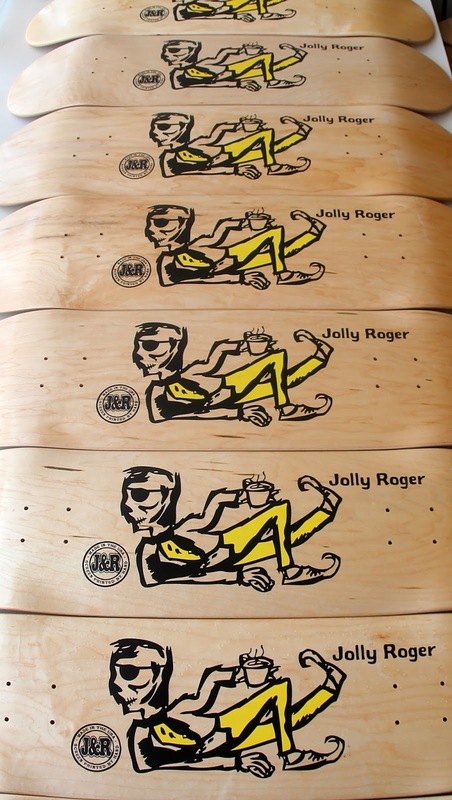 Jolly Roger Skateboards: HOT OFF THE PRESS: Jolly Roger Blender Decks! HOT OFF THE PRESS: Jolly Roger Blender Decks! The time has come for more Jolly Roger decks to hit the shelves! This time we pay homage to one of the most creative skaters of all time, Neil Blender. Not only was he the first skaters to actually draw his own board graphics but he also invented many of the tricks that can be seen in Street League today, such as the: lien air, gay twist, new deal, wooly mammoth, good buddy, fastplant, jolly mambo and my personal favorite the donner party. These decks are screen-printed by hand and are available in 7.75, 8, 8.25, 8.5, 8.8, 9 and we have a few cruisers and pool shapes. IT'S 2017 BOYS WE NEED MORE SKELETONS. - Neil Blender. *You can pick one of these decks up over on our online store right HERE.